If you thought March might be a slow month for you, we can change that right now and keep you busy learning and networking deep in the heart of Texas. This is a huge event in Austin that just keeps getting bigger every year with 3 separate conferences which merge into one giant week. SXSW runs from March 13-22 this year and features Music, Film and Interactive. 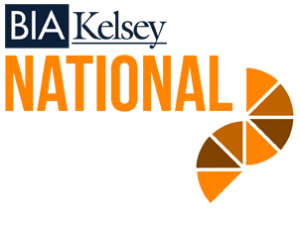 The BIA Kelsey National conference is being held in Dallas March 25th – 27th and brings the unique perspective of local for national brands. As a national or multi-location business it is important that you know how to reach your target audience where they are locally. To help you do this or to just do it better, BIA Kelsey has marketing experts from Facebook and Google, plus major national brands like PricewaterhouseCoopers, who will teach you how to do the same for your brand. You will also have the opportunity to hear from Bernadette Coleman, the #QueenofLocalSEO, as she shares the local SEO strategies that Advice Interactive and Local Site Submit, an Advice technology, employs for their clients. This is a one day, March 31st, invite-only conference where attendees will overcome the common “information overload” they feel at some conferences with straightforward sessions that give three specific takeaways. Two of our own are speaking, Lissa Duty, presenting a session on “Social Media Strategies for Enterprise” and on the “Digital Enterprise Keynote Panel”, Bernadette Coleman. If you haven’t requested your invite do it now. There are a few spots still available. 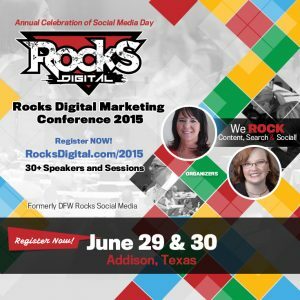 And, finally, if March is just all booked up and you need to plan a little farther ahead, then it is time for you to save the date of June 29th – 30th for the Rocks Digital Marketing Conference in Addison, TX. Rocks Digital is the culmination of 2 local digital marketing authorities, Lissa Duty and Bernadette Coleman who brought together their previously separate conferences, DFW Rocks Social Media and The Local Social, and created one of the best Digital Marketing Conference in the Nation – Rocks Digital! This year you will learn from over 30 speakers in 30 plus sessions covering virtually every aspect of the digital marketing spectrum. As with the last 3 years, 2015 will include Mashable’s Social Media Day (June 30th) Tweet up in a post conference event you just don’t want to miss. So, save the date now, purchase those plane tickets and make your hotel reservations now for Rocks Digital 2015! As you can see March is filled with opportunities to learn, grow and network in the digital marketing industry and the rest of 2015 doesn’t show to be slowing down. Make your plans now to visit Texas and learn why Texas and 2015 is the right place to be and the right time to be there for digital marketers and small business owners. What digital marketing events do you attend? How do you stay current with the important trends that impact your business daily?